Surrounded by the lush green forest of British Columbia, Canada, a young cougar finds a clearing to see what is lurking about. Even though the cougar is the largest wild cat throughout British Columbia, it is extremely graceful and able to move very quickly. A young cougar can sometimes look like an overgrown kitten but approaching too close is never advisable. 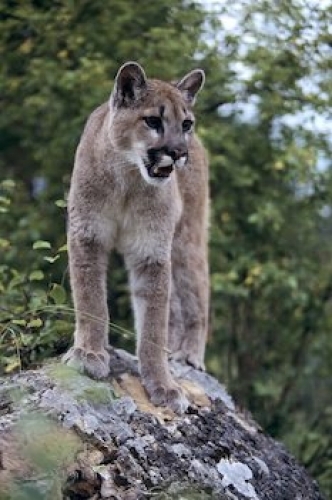 Picture of a cougar atop a boulder in British Columbia, Canada.